What’s the best ball for you? In the modern era, we often take technology for granted and can sometimes feel a bit hard done by the great game. In reality, we are super fortunate to have so many fantastic options in the current marketplace. Clear our own golf resentments for one brief moment and let us imagine how difficult it was in a different place in another time. Through the 14th to 17th centuries, your best-performing ball was nothing much more than a wooden ball – round and aerodynamic if you were lucky enough. I just don’t see much spin, distance and ballistic penetrating trajectories coming out of that. Unless you had a connection from the Netherlands, then you could have access to a tour spec ball (from 1486) known as a featherie or feathery. What was so special about this game changer of the time is that it cost between 2 -5 shillings. Equating today to about 10- 20 US dollars, R170-R340 per ball on the current South African exchange rate. Modern tech of the 1400s dictated that the feathery was a round leather hand-sewn pouch, commonly painted white, stuffed with either goose or chicken feathers. In correct accordance with using a Top hat of feathers allocated for each ball. A long, arduous and expensive tale of a mulligan some might say. With the best ball makers of the time only being able to make a few balls each day. We are not Gary Player and can be very grateful to all the Tech and performance we have access to in this highly developed piece of equipment. Golf balls will perform differently for different golfers. Player specific variables like ball speed (related to clubhead speed), launch angle, impact, and spin rate are all fundamental, mechanical factors that affect ball performance. Ball features like construction, compression, cover hardness, spin rates and most definitely, the price will all be factors to look at when to finding your best ball. Choosing the correct ball make, will make a difference. Today we are lucky with so many great options on the shelves. But the common mistake I see is that golfers place too much emphasis on brand and price. Remember you use the ball on every shot and if you are serious, I really would suggest you go through the effort and have your swing / ball speed tested. Evaluate the relevant ball category you fall into with price points and go try a few out. Compare performance and feel for yourself. I love trying out new gear and am very lucky with the job spec. I recently tried out the new TaylorMade TP X (despite my reservations and loyalty towards another premium golf ball brand). At my home course Royal Johannesburg and Kensington in December. Just before the Johannesburg Open 2016 and it is these moments that just will change your mindset a whole 360°. On the par 5 2nd, I had hit my drive over 300m which in all honesty was a career smash knowing my regular placements. Having recently switched to the TaylorMade M1 ~ www.golfweather.com/golf-reviews/the-ultimate-driver-m1/1264. I was left with a 167m uphill approach; irons being are the Mizuno Mp53s with Dynamic Gold S100s in them (Nothing fancy but a superb forged feel). Needless to say, I holed out with a career 7 iron. The feel off the clubface was so sweet and crisp with the bounce and check as it landed was an amazing feeling. Albatross! Yes, a big pot of luck, some skill (golf swing was working then) but having the correct equipment but using a great performing ball was the hidden gem. I have since stayed with it – not to sound superstitious and am still more than happy with the overall performance. A side note and something to be aware of while looking your various ball options is the compression. A quick breakdown, defined as an action of compressing or being compressed. Compression creates density in the golf ball thereby affecting distance and loft. Compression in balls, range from 70 to 110 (using a compression ratio). Low compression balls (70-80) are intended for players with slower swing speeds who may be looking for more distance. Higher compression (90 and above) are for your better players or low handicappers with faster, stronger swing speeds. The TP /TPX line is targeted for the better player or “Tour Player” who wants the pure ultimate performance from tee to green. TaylorMade the people behind the ball. REACT™ Core - Promotes fast speed off the driver and soft feel throughout the bag. Spin Mantle™ Technology - Inner layers designed to promote consistent approach shot spin. New Soft Tech™ Cover - New softer cover material promotes improved greenside spin and control. Seemless LDP® 322 Dimple Pattern - Promotes penetrating ball flight for more distance into the wind. Tour talk says the TP is a higher iron spin version and suitable for someone like Camillo Villegas who is more of a “sweeper” and needs a golf ball that generates higher iron spin. The TPX, the lower iron spin version, is better for someone like Sergio Garcia, who hits down on the ball more and generates a lot of spin. The TPX helps knock down the spin to generate a flatter iron trajectory for more consistency into the wind yet still holds very well. Best described as a Tour Ball for amateurs, anyone in the 8-18 handicap range and if you are looking for more spin, especially around the greens. This is a fantastic option in the marketplace. Using the same urethane cover as the TP/TPX balls, this is a great performer. A cool video of what TaylorMade is thinking. A 3-piece distance ball that is long off the tee and softer around the greens. The new REACT core and IOTHANE cover offers speed and distance. 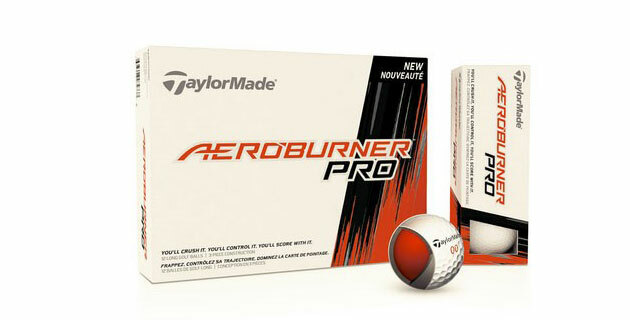 TaylorMade Aeroburner Pro balls are extremely long and help players of all abilities hit it farther than ever before. 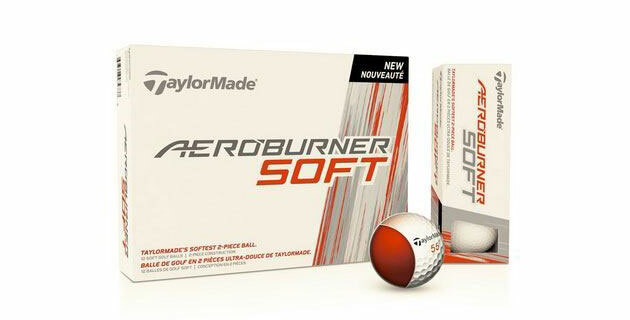 A 2- piece golf ball that utilizes a soft core and new Iothane56 cover that will be long off the tee, again at all swing speeds, and offers a very soft feel and best in class greenside spin. Older Versions? If you use the RBZ, Burner or SuperDeep balls, the AeroBurner Pro, and Soft will be as long but now offer a softer feel and better spin around the greens. A pure distance ball that is a great value. Your entry level ball.